In disappointing news, AGL Energy is looking at options to increase its investment in the Loy Yang A power station and adjacent brown coal mine. The news has cast doubt on AGL's environmental commitment. AGL has previously said that it is committed to increasing the percentage of its energy generated from low and zero carbon sources, which is currently 52 per cent gas and 30 per cent renewables. Brown coal fired power from Loy Yang A is about 18 per cent. However, a greater stake in Loy Yang A would reverse the trend and greatly increase its reliance on coal fired power. AGL owns 32.54 per cent of Great Energy Alliance Corporation Pty Ltd (GEAC), which owns Loy Yang A power station and more than 1.6 billion tonnes of coal. AGL is in discussion with the other GEAC shareholders about the future ownership structure of GEAC, including the acquisition of the 32.54 per cent owned by Tokyo Electric Power Company (TEPCO). The fact that AGL is considering increasing its stake in a coal fired power station is enough for Eco Investor to downgrade our rating of AGL's environmental commitment from high to medium. If AGL proceeds with the acquisition of another part or the rest of Loy Yang A, and changes its asset mix, Eco Investor will cease coverage of AGL. Noticeably absent from this list are any environmental considerations. AGL was already turning into an environmentally problematic investment due to its controversial handling of water and land use issues around coal seam gas in NSW. DUET Group saw its net result after tax for the December half fall 34 per cent on the December 2010 half to $40 million. This was mostly due to a $32.7 million change in unrealized derivative and actuarial movements between the periods. Revenue rose 7.5 per cent to $495.3 million, and earnings per security rose of 7.4 per cent to 13.1 cents. The full year distribution guidance of 16 cents per share is unchanged. Sims Metal Management made a net loss for the December half of $556.5 million. This was due to write downs in goodwill as previously flagged. the prior corresponding period. Revenue increased 16 per cent to $4.6 billion. Scrap intake and shipments were 7.3 million tonnes and 7.2 million tonnes respectively, each an increase of 10 per cent on the prior corresponding period. Group chief executive officer Daniel W. Dienst said "Continued tough conditions in North America and the UK, particularly for the traditional recycling businesses, adversely impacted operating margins and equity accounted profits, particularly towards the end of the first half. "Our performance in the first half of Fiscal 2012 in Europe, excluding the UK traditional metals business, and Australasia, were satisfactory, but we were deeply disappointed by our results in North America, a region that seemed to have turned the corner in the second half of Fiscal 2011 but was once again challenged by weak intake and margin pressure, particularly in ferrous metals. "Results in North America were impacted by atypical items that decreased EBIT by $584.7 million, most of which relates to a non-cash goodwill impairment charge (including goodwill impairment in a joint venture). Other adverse atypical charges, other than goodwill impairment, were circa $16 million." The write-down of goodwill is a non-cash item and does affect dividend policy, growth strategy, or the share buy-back plan. Shares in GWA Group have fallen 14 per cent, from $2.50 to $2.15, since the company announced a disappointing half year result and outlook. Net profit after tax was $13.3 million, a decreased of 60 per cent on the December 2010 half, due to restructuring costs and losses from discontinued operations. Revenue from continuing operations of $315 million was in line with same period last year. The fully franked interim dividend of 9.5 cents per share is the same as last year. This is a 104 per cent payout ratio on trading profits from continuing operations. Managing director Peter Crowley said "The half has been successful in terms of finalizing the sale of non-core businesses, which will allow us to focus on the Australian building fixtures and fittings sector. Restructuring of local operations has also progressed to plan to improve the group's overall competitiveness. The benefits of this restructuring will be reflected in the results for the 2012/13 financial year and future periods." Sales by the Bathrooms & Kitchens segment fell by 11 per cent due to the cessation of government stimulus spending and the reduction in building and renovation activity. Sales by the Door & Access Systems segment increased by 63 per cent, due to the inclusion of Gliderol. Competitive pressure has caused some margin compression and market share loss in the Gainsborough door hardware business. The company is working to improve Gainsborough's position through new market offers like the Electronic Access System launched in December, he said. Mr Crowley said "Our priorities are to keep focusing on our core building fixtures and fittings businesses through cost reductions, product development and market initiatives to grow revenue, and ongoing improvement in supply chain management. We are continuing to look at acquisition opportunities, but with the market uncertainty we are currently reviewing priorities. "The outlook for 2011/12 is difficult to assess, however our businesses are in good shape and, with restructuring largely complete, we can focus on market initiatives. Securities in takeover target Hastings Diversified Utilities Fund reached a new three year high of $2.15 on 16 February. Shares in Toxfree Solutions reached a one year high of $2.50 as the company completed the acquisition of the assets of DoloMatrix International. The acquired businesses are estimated to deliver 2011-12 earnings (EBITDA) of $11.5 million on a pro forma basis. Excluding transaction costs, Toxfree is acquiring the businesses on 5 times estimated 2011-12 EBITDA. The additional employees will lift Toxfree's employee count to over 700. Toxfree managing director, Steve Gostlow, said the acquired technologies enhance Toxfree's existing hazardous waste services and enables the company to offer a broad range of environmentally sustainable waste treatment options. There is growing emphasis towards resource recovery and landfill avoidance and Toxfree is well placed to capitalize on this growing market driver." Meanwhile, Toxfree has won a contract to provide waste management services for Fortescue Metals Group (FMG) at its Cloudbreak and Christmas Creek mine sites in the Pilbara. This includes the management of all waste from the operations, the operation and maintenance of FMG's landfill at Cloudbreak and design, and the operation and maintenance of a waste and recycling transfer station at Christmas Creek. Toxfree will establishment a joint venture with a local indigenous contractor. Infigen Energy has recorded lower US revenue and lower Australian and US production for the December half compared to the December 2010 half year. Australian revenue is up 7 per cent to $63.9 million, but US revenue is down 1 per cent to US$62.5 million. Australian production is down 1 per cent to 716 GWh and US production fell 7 per cent to 1,368 GWh. Low wind is the main reason. Australian revenue was higher due to improved wholesale electricity and Large-scale Generation Certificates (LGC) prices and the initial contribution from the Woodlawn Wind Farm, partially offset by lower production. At 31 December Infigen held 204,000 unsold LGCs. Unsold LGCs contributed $8.5 million to the Australian revenue figure. CBD Energy expects to report a net loss of $3.5 million to $4 million for the six months to 31 December 2011, and is negotiating the takeover of a US solar company. The timing of the recognition of significant renewable energy project development and brokerage revenues could lead to further adjustments to the half year result, it said. The results have been impacted by a number of one-off expenses and the company expects that results for the second half will show significant improvement and be in line with internal targets. CBD Energy is negotiating the merger of its operations with US based and NASDAQ listed Westinghouse Solar, Inc. A letter of intent is expected to be finalized in March. Under the terms conditionally approved so far, Westinghouse Solar shareholders will be issued shares in CBD Energy in exchange for their shares of Westinghouse Solar. Current CBD shareholders could end up owning 85 per cent of the combined company. Westinghouse Solar is a designer and manufacturer of solar power systems. It is a small company, with 2011 revenue of US$$11.4 million, up on US$8.7 million in 2010. But it is not profitable. Its net loss in 2011 from continuing operations was US$4.5 million. Shares in Clean TeQ Holdings have continued their impressive recovery to a new one year high of 19.5 cents on 15 February. Less than a month earlier they were 3.5 cents. The good operational news continued with a return profitability in the December half, and an upgrade from $1.2 million to $3.6 million to the July 2011 contract to supply treatment plants for the processing of leachate and groundwater at two landfill sites. The contract is for the design, supply, installation and commissioning of two water treatment plants to reduce ammonia and adjust pH of landfill leachate and groundwater to a quality suitable for disposal by trade waste discharge. The removal of nutrients, such as ammonia, is an important step in the client's environmental strategy to reduce the nutrient load from these landfill sites, said Clean TeQ. The half year ending 31 December 2011 is the start of the turnaround from the corresponding period last year with increasing revenue and contracts and a return to profitability, said chief executive officer. Peter Voigt. The return to profitability was small, $107,00 after tax in the December half, but it also came with a big lift in revenue to $5.6 million from $3.3 million in the December 2010 half. "We have made a deliberate decision to limit our activities in the Mining side of the business to conserve resources for the strongly growing Air and Water Divisions," he said. DoloMatrix International has completed the sale of its assets and business to Toxfree Solutions. The $58 million consideration is subject to normal adjustments that should take about four weeks. DoloMatrix intends to distribute on 29 February 2012 an initial part of the proceeds through a 35 cent per share capital return. Revenue was up 18.7 per cent to $8.27 million. Basic earnings per share was 7.69 cents, and the dividend is 3.48 cents per share fully franked. The company said it has strong forward contracts of over $60 million and is well placed to meet its full year prospectus forecast of net profit after tax of $3.8 million. The trading results were driven by two factors: the growing trend for businesses to outsource non-core services such as energy management, and greater use of its leading energy auction procurement platform, The Australian Energy Exchange, by an increasing number of Australian businesses, said chief executive Valerie Duncan. The Australian Energy Exchange again performed very well as more businesses look to address the increasing cost of gas and electricity. "The growing use of our Australian Energy Exchange is also building greater awareness of Energy Action's broader energy management services, which present us with a strong growth platform for the future," she said. (ASX: EAX). Simon Henry has continued to increase his interest in Hydromet Corporation and has now reached 15.5 per cent. (ASX: HMC). 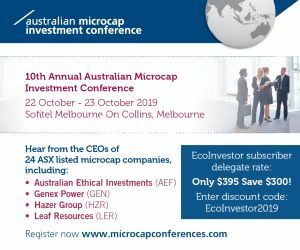 Australian Ethical Investment, which manages the Australian Ethical Smaller Companies Fund, has appointed David Macri as chief investment officer, following the decision by James Jordan's to return to the Public Service. Mr Macri joined Australian Ethical in 2009 as an equities analyst and portfolio manager, and is highly experienced, said Australian Ethical. His career includes time with Macquarie Group, Credit Suisse, Mellon and Mercer covering strategic and tactical asset allocation, sell-side and buy-side research and portfolio construction as well as asset consulting and rating agency process management. "He is very well respected by his colleagues and has a broad base of experience that is well suited to our investment style and product suite," said Australian Ethical's managing director, Phil Vernon. Shares in Clean Seas Tuna hit an all time low of 6.1 cents on 16 February. On the previous trading day, Clean Seas said Yellowtail Kingfish production, particularly juveniles, was impacted over the summer by unusually bad weather which resulted in health implications and a higher than anticipated rate of mortalities. The health difficulties will impact the company's full year results, said chief executive, Dr Craig Foster. The best growing conditions for Yellowtail Kingfish in Spencer Gulf occur in the second half of each financial year and that only limited growth is achievable with the lower temperature regime experienced in the first half, he said . Clean Seas will report a fall in the order of 40 to 50 per cent in its pre-tax loss for December half compared to the first half results in FY2011 of a $13.3 million loss. But the improved result was not enough to move the shares positively. The result will reflect the program of reducing costs and improving operations in the face of economic hurdles, such as the high exchange rate. Richard Keevers has resigned as a director of Electrometals Technologies. The board said Mr Keevers made a significant contribution to the company, particularly in taking the role of chief executive at a critical time in the company's development. Mission NewEnergy said that gross revenue under the six months contract to supply sustainability-certified biodiesel to a global oil major is expected to be lower than expected. The contract, which commenced in January 2012, was expected to generate revenue of around US$40 million. However, under the contract the customer has the option to cancel monthly shipments and opt to pay Mission a fixed fee per cancelled shipment instead. The customer has cited cheaper supplies from elsewhere and advised Mission to cancel the March and April shipments, reducing expected revenue by about $14 million based on current prices. Mission has shipped the January load and is expected to ship the February load soon. "Palm biodiesel from Malaysia is facing stiff competition from Palm biodiesel produced in Indonesia due to a more favorable tax regime in Indonesia which ensures cheaper feedstock prices for Indonesian producers," said Nathan Mahalingam, Group CEO of Mission. "The Malaysian biodiesel industry has virtually ground to a halt except for production to cater for the local Malaysian B5 biodiesel mandate. The company progresses to improve supply quantities to the its local customers, albeit very slowly," he said. Mission also announced that its unaudited half yearly revenue of $20.3 million, up from $5.7 million in the December 2010 half year, and net profit after tax of $3.8 million, up from a loss of $14 million. Nanosonics said it is continuing its steady sales growth with revenue increasing $3.71 million to $5.08 million in the December half year. As well as sales growing quarter on quarter in North America, new revenue stream was from service contracts for the Trophon EPR sterilizer in Australia and New Zealand. Production capacity has reached 6,000 units per annum. The December half saw a reduced net loss after tax from $4.54 million to $3.05 million. - Wall mounts so the Trophon EPR can be fixed on central wall eliminating the need for additional bench space. - Accessories such as pre-disinfection cleaning wipes which support the reprocessing of probes at the point of care, a key benefit of the Trophon EPR. RedFlow is to accelerate its engagement with larger customers and system integration partners in the US market, and is shipping five R510 energy storage systems to selected US customers and partners. The company has a small sales presence in the US and has participated in industry conferences there. The company's first zinc bromine battery module (ZBM) was delivered to the US in November 2011 for testing at Sandia National Laboratories. RedFlow's global manufacturing partner, Jabil Circuit, Inc, is headquartered in the US and the company says this relationship can also assist it to develop sales and market channels. RedFlow plans to build on this US base in 2012 through engagement with a range of system integration partners and customers, and discussions are underway. To accelerate the process, the company has engaged specialist cleantech energy advisory business Jane Capital Partners, LLC (JCP). The agreed fee structure comprises cash and scrip. A report by Pike Pulse Research entitled "Electric Motorcycles and Scooters" has assessed the strategy and execution of the "Leading 12 Electric Motorcycle and Scooter Manufacturers in the World", and placed Vmoto at number 5. This was based on current market position, product advantage, company strategy and quality. Vmoto says it was the only manufacturer in the top 5 that manufactured scooters for export under its own brands, namely Vmoto and Emax. One of the 12 companies' product is partly manufactured by Vmoto on an OEM basis. The number 2 manufacturer, Jiangsu Xinxri E Vehicles, only sells electric scooters within China. One of Vmoto's directors, Jacky Chen, is also a senior executive at Jinagsu. Vmoto said that out of the top 5 companies, two are solely motorcycle manufacturers, with one selling only in China and the other producing generic scooters for OEM brand distribution in overseas markets. "This leaves Vmoto as the only true stand alone electric scooter manufacturer that distributes its own products," it said. Vmoto's electric Emax product range consists of nine models: 90S, 110S, 120S, 120S Delivery, 120LI, 120LI Delivery and 80L City, with four new models: 80S  Domestic China, Retro "Green" S - Domestic China, 140L and 140L 16 Inch under development, some of which are expected to be available in early 2012. Vmoto says it has an extensive sales pipeline. For example, in Europe it delivered another 160 units of the 120SD model in January 2012 to the Correos Spanish Post fleet. The first shipments have been delivered through its agent to TNT Courier Services of Italy and follow up orders are expected. A container for another Italian customer is expected to be ordered this month. The first trial cargo has been delivered and is being evaluated by Eon, who have advised that they will order a further 84 units shortly. Sales are also progressing in Holland and Germany, and are being developed in Hungary, Slovenia, Belgium, Croatia, and Switzerland. Sales channels are also being developed in Columbia, Brazil, Mexico, South Africa, Malaysia and Hong Kong. Sales in Australia grew with 50 Vmoto 110S scooters delivered to over 50 individual customers, making the model Australia's number 1 selling electric scooter. Negotiations with Dominos Pizza are ongoing and they have ordered ten 110SD scooters. Dominos management has also ordered a lithium powered 120LD scooter for testing. The test scooter will arrive in Australia soon. Vmoto has working models of its Green Scooter undergoing trials in China and hopes to have models for distribution in the second quarter of 2012. Although Vmoto "is firmly focussed on the electric scooter market", it still has high quality petrol powered scooters that are also manufactured at the company's Nanjing facility in China. Sales of the All Wheel Drive Scartt model are steady, with most product sold in New Zealand. A sample has been shipped to a US customer for testing. The company says it is in initial discussions with a number of parties about the electrification of the All Wheel Drive Scartt. Shares in WestSide Corporation have more than doubled to a one year high of 58 cents on news that it has received interest from a possible acquirer at 65 cents per share. WestSide said it has "received an indicative, conditional, non-binding and confidential proposal from an unrelated party (Potential Acquirer) to acquire all of the shares in WestSide for cash consideration of $0.65 per WestSide share (Indicative Proposal)." The price is based on a number of assumptions about WestSide's business, including its share of gas reserves and gas delivery rates from its existing tenements. It is conditional and subject to due diligence and approvals including third party approvals. The WestSide board said it has not formed a view and advised shareholders to take no action at this time while it works co-operatively with the potential acquirer to progress the indicative proposal on a non-exclusive basis. Meanwhile, WestSide has seen a significant upgrade to its total reserves from a report on the Meridian SeamGas gas fields in Queensland by independent reserve certifiers MHA Petroleum Consultants LLC. WestSide's total net 3P reserves have increased 96 per cent or 356 PJ to 725 PJ while 2P reserves increased 17 per cent or 37 PJ to 258 PJ and 1P reserves rose 86 per cent or 3 PJ to 6.5 PJ. Chief executive officer Dr Julie Beeby said "There remains an upside to the current total reserve position, particularly to further increase the 2P reserves by conversion of the newly certified 3P reserves from the upper and lower seams." In response to an ASX inquiry about its cash position, AnaeCo said that it has commenced planning for its next fundraising event, which is likely to occur in the June quarter. This is in addition to working towards placing the shortfall of $1,256,000 on its recent share purchase plan, which it is confident of placing before the final date of 29 February. It has also applied for a grant of up to $3.2 million from the Federal Government's Emerging Renewables program, and is awaiting feedback. Subject to shareholder approval Blue Energy will have a new director, raise $10 million through a share placement to professional and sophisticated investors, and offer a share purchase plan. John Ellice-Flint has agreed to join the company as an executive director. However, the approval by shareholders of all resolutions is required before the appointment of Mr Ellice-Flint or the placement can proceed. Mr Ellice-Flint is an experienced senior executive in the global oil and gas industry having worked for 26 years with Unocal and as managing director of Santos. His role at Blue Energy will include technical oversight of exploration activity in Queensland, the pursuit of new venture growth opportunities, and building the current reserve base to 3,000 PJ of 3P reserves by the end of 2014. Blue Energy has negotiated the placement of 160 million shares at 6.25 cents each to execute programs in its Sapphire and Monslatt Blocks of ATP814P in Queensland, and given sufficient funds, targeted activities on other Blue Energy permits. The Sapphire and Monslatt Block programs are expected to deliver up to 1,500 PJ of 3P reserves and up to 800 PJ of 2P reserves. Shares in Dyesol fell to their original IPO price of 20 cents on 16 February. It is a huge fall for the company which listed in 2005 and has seen its 20 cent shares soar to a high of $2.35 in August 2007. Enerji has raised $81,230 through the issued of 6,769,231 shares at 1.2 cents each and 3,384,616 listed options with an exercise price of 3 cents expiring 30 June 2015. The placement was to a private investor. Kimberley Rare Earths has identified multiple heavy rare earth oxide exploration targets at its 40 per cent owned Malilongue Project in Mozambique. The project has not previously been subjected to systematic mineral exploration. High resolution aeromagnetic/radiometric data from 2008 by KRE's project joint venture partner has been acquired and reprocessed to reveal considerable heavy rare earth potential within the project tenure, it said. The largest and highest priority target has been named the Vundu prospect and measures 3 kilometres. KRE intends to conduct ground radiometric surveys, soil geochemistry and geological mapping programs to define targets for drill testing as soon as access to the area is achieved after the current wet season. This is expected to be in March. Meanwhile, the interim resource statement for the company's Cummins Range project in WA has confirmed an 18 per cent increase in contained total rare earth oxides (TREO) to 85,000 tonnes at a 1 per cent TREO cutoff. Strategic Elements has been granted six prospecting licences in Ireland with five areas in Wicklow County and one area in Mayo County. John Canaris has resigned as managing director of Torrens Energy, but will continue as a non-executive director and a key shareholder. Torrens said Mr Canaris was the founding managing director and instrumental in establishing and building the company's geothermal assets since inception and will continue the ongoing management of these interests. The company continues to review new non-geothermal opportunities to enhance shareholder value in the near term.